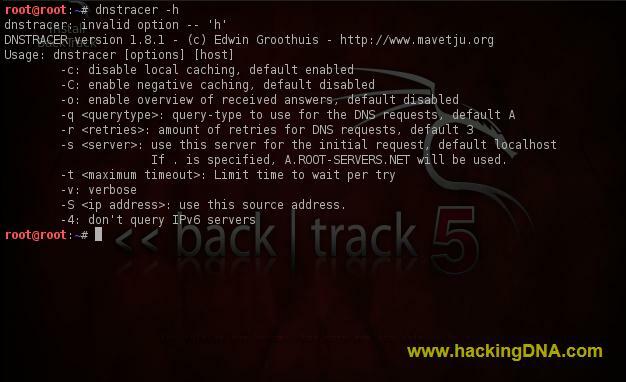 dnstracer - trace a chain of DNS servers to the source . dnstracer determines where a given Domain Name Server ( DNS ) gets its information from, and follows the chain of DNS servers back to the servers which know the data . Enable overview of received answers at the end. Change the query-class, default is A. You can either specify a number of the type (if you're brave) or one of the following strings: a, aaaa, a6, soa, cname, hinfo, mx, ns, txt and ptr. Number of retries for DNS requests, default 3. DNS server to use for the initial request, default is aquired from the system. If a dot is specified (. ), A.ROOT-SERVERS.NET will be used. -vBe verbose on what sent or received. Use this as source-address for the outgoing packets. It sends the specified name-server a non-recursive request for the name. Non-recursive means: if the name-server knows it, it will return the data requested. If the name-server doesn't know it, it will return pointers to name-servers that are authoritive for the domain part in the name or it will return the addresses of the root name-servers. If the name server does returns an authoritative answer for the name, the next server is queried. If it returns an non-authoritative answer for the name, the name servers in the authority records will be queried. The program stops if all name-servers are queried. Make sure the server you're querying doesn't do forwarding towards other servers, as dnstracer is not able to detect this for you. It detects so called lame servers, which are name-servers which has been told to have information about a certain domain, but don't have this information. This is how you can use this tool , more example will be added soon .